Trying to find a new recurve bow can sometimes be complicated because there are so many different brands and types on the market. It might not seem too daunting for some of you since you might think that all you have to do is pick a bow that is durable and comfortable. However, there are other critical points that you need to consider. To develop your skills and enjoy archery, it’s essential to have a recurve bow with a length and draw weight that is suitable for your height, weight, and body frame. Generally, using a bow that is too big could result in you injuring yourself, while picking a bow too small may cause you to aim incorrectly. Similarly, if the draw weight is too high and you do not have enough experience, then it might cause muscle fatigue and strain. When looking for a new recurve bow, you should also look for features that correlate with what activity you’re going to use it with. If you want to use it for target practice or are just starting to learn how to use a bow, you need to find a recreational recurve bow. If you’re planning on using it to hunt, then you need to find a heavy duty bow. To make it easier for you, we’ve written a short review of one of the products of Southland Archery Supply (SAS), a company that has been producing bows and accessories since 2007. The metal riser SAS Explorer Takedown Recurve Bow is excellent for archers who aren’t exactly sure what type of bow they are looking for but still want one that is stylish and durable. Bow is 66 inches long! The SAS Explorer Metal Riser Takedown Recurve Bow is crafted using fiberglass and is covered with a maple lamination. This combination ensures that the outside of the bow will look good without compromising performance. The sturdy build not only helps the bow have increased durability but also have better flexibility. Although the bow will slightly bend if misused, it will never break. The riser is made of aluminum and has been polished to give it either a red or blue finish. This provides the bow with a modern twist on an old-fashioned type of recurve bow. Its overall length is about 66 inches; hence, it is designed for individuals with taller statues, specifically those who have a height of at least six feet. Another problem with this recurve bow is it only comes with a right-hand orientation which, of course, makes it unsuitable for lefties. Nonetheless, the limbs can be changed to have a draw weight of 22, 26, 30, or 34 pounds, making it possible for you to have a bow that meets your skill level and body build. This also ensures that you will not outgrow the bow too quickly. Additionally, the bow is super lightweight and slim when compared to other bows on the market, making it perfect for people who are searching for a slim bow that is easy to carry around and handle. This bow comes disassembled but assembling it won't be much of a hassle. Disassembling it again also won't take much of your time, so you can place it in your bag when traveling to the archery area and when you are heading home. This also ensures that it will not take up too much storage space. If you’re not entirely sold on the SAS Explorer Metal Riser Takedown Recurve Bow, then you may be interested in the Southwest Archery Spyder XL Takedown Recurve Bow and Arrow Set, a product that is also manufactured by an established company. When you purchase this kit, you will receive one bow, one pair of matching limbs, one 14-inch strand Dacron string, one stick-on adhesive arrow rest, and step-by-step instructions on how to assemble it. However, do expect that it comes at a higher price than the Explorer. With regards to the bow, it is available in right and left-handed orientations. The drawback weight is between 30 to 55 pounds which gives you higher impacts and power each time you shoot an arrow. The problem is that you must have enough muscle strength and experience to achieve an accurate shot. The bow includes preinstalled threaded bushings which can hold various accessories, which is useful for individuals who don’t want the hassle of fully assembling the bow. You can also use the threaded bushings to install mechanical rests, sights, quivers, plungers, stabilizers, and bow fishing reels. The SAS Explorer Metal Riser Takedown Recurve Bow is a highly durable, stylish, and bendable recurve bow that not only excels in precision but also looks modern. 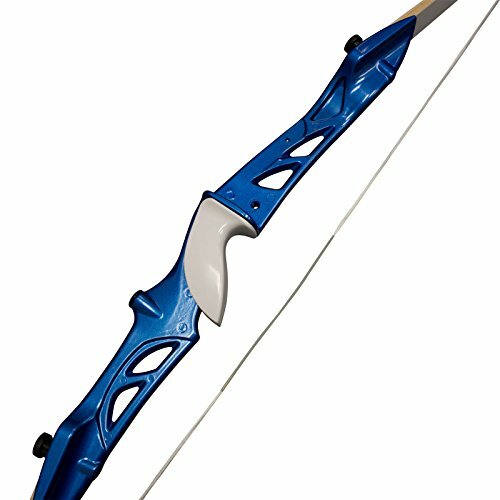 This bow is guaranteed to be a head turner wherever you go, or anywhere you use it because of its red and blue designs, maple lamination limbs, and metal outline. The drawback weight or pullback force makes it perfect for lightweight activities like recreational shooting, target practices, and archery competitions. This is also the ideal bow if you want to learn how to hunt. 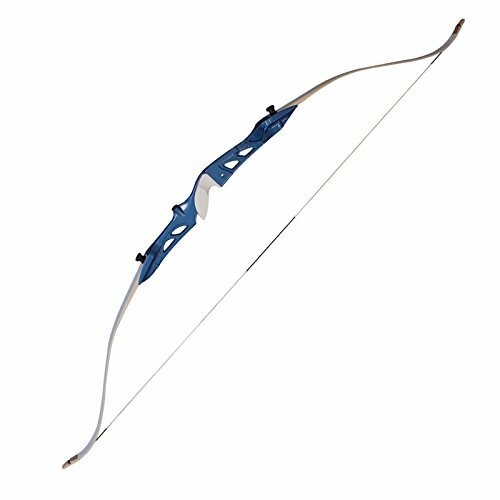 While this bow can be used for light hunting, we highly suggest that this should only be used as a beginner hunting bow. It can be powerful but it does not meet the requirements for mid-sized and large game animal hunting activities. In a nutshell, the SAS Explorer Metal Riser Takedown Recurve Bow is a great product for beginners and individuals who are tall but just starting to develop their back and shoulder muscle strength. We suggest that you start with the lightest draw weight, and then, increase it after several practice round. Once you have stronger upper body strength, then you will likely want to shift to another recurve bow which has a draw weight of more than 35 pounds. Want to Learn More About the SAS Explorer? Check Out the Latest Reviews on Amazon.com! If you don't like the Explorer, why not check out our detailed list of the best SAS recurve bows!